Technology has a tremendous influence on our daily lives. Now, more than ever, it goes unnoticed as it works in the background making the world work. On servers that run the websites we access and store the music and movies we stream, on microchips and compact metals that run our cell phones and laptops, in the machines that we use for transportation such as cars and lightrail: many of these work because of technology developed during the last couple decades. Technology seems to be synonymous with computers in recent years. Computers are the guides behind all of these devices that are emerging in better and more compact forms. Robots are motorized devices run by a computer. A technology that has seen much recent development, and involves the guidance of robotic parts by special computer software with complex instructions, is 3-D modeling and printing. It appears to be a simple and every day term, printing, but the technology behind 3D printing and manufacturing is incredibly complex. More so, in the world of medicine where it is further emerging. One example of a newer technology involving 3D modeling and creation is in the dental industry. This advance in dental tech allows the creation of dental prosthetics at dentist’s office, versus waiting for an outside laboratory, using 3D photography to model the prosthetic and 3D manufacturing to produce it. 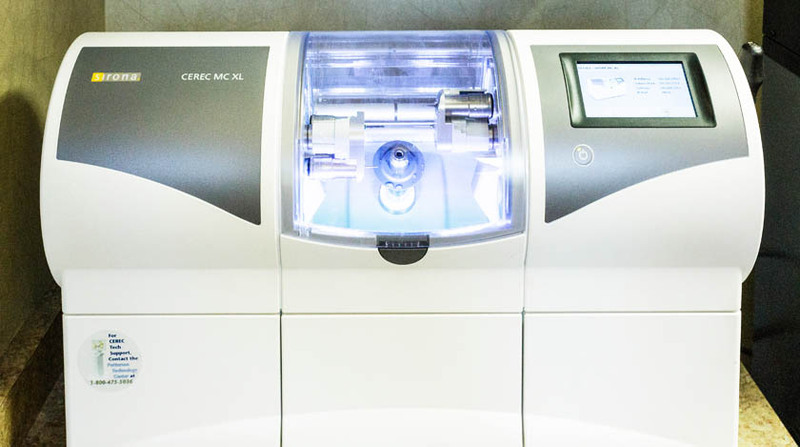 Dr. Shore’s Practice has adopted this optimized technology with the CEREC, a manufacturing process that allows crowns to be produced for patients the same day of their visit. During one office visit, as opposed to 2 or 3, a dental crown can be imaged, created, and fitted. The process takes around 2-3 hours versus the many hours and visits that traditional crown production takes. This reduces the amount of time a patient needs to be at the dentist office and eliminates the wait time a patient has to endure between visits with a temporary or missing crown. The process starts with a specialized 3D camera that is used to image the mouth, jaw, and adjacent teeth. From there, the images are perfected into a design that is approved and sent to the manufacturing machine (in the Practice’s lab – same office) that will produce the crown based on approved specifications (dimensions and color). Once the crown is created, it is reviewed to ensure correctness. It is then fitted into the patient’s mouth and examined for functionality, comfort, and appearance. Done! And all in one visit that averages 2 hours. The same-day crown procedure is one of the latest ways that the Practice is adopting newer technologies to save patient’s time and reduce their discomfort. We are happy to explain any aspects of this process to you, if you have questions. Call our Practice to ask Dr. Shore during your next visit.